Done with a life of exploitation and violence, Lori Anderson is training to be a bounty hunter. Holed up in the Georgia Mountains with her reclusive mentor, JT, Lori is determined to put her new skills into practice. Behind JT's back, she breaks his rules and grabs the chance she's looking for. Will her gamble pay off, or will she have to learn the hard way? One of my favourite reads of the past year is Steph Broadribb's debut crime novel Deep Down Dead, a terrific, action-packed thriller set in America's Deep South which introduced bounty hunting momma Lori Anderson. Sultry and suspenseful, Deep Down Dead is an absolute cracker of a debut that introduces a fresh voice to the crime scene, one that has a strong, compelling narrative voice. I've been keenly awaiting the next instalment in the Lori Anderson series, Deep Blue Trouble, but while that;s still a few months away, today I was very glad to discover that Broadribb has given us a tasty wee amuse-bouche in between full courses: a Lori Anderson short story. 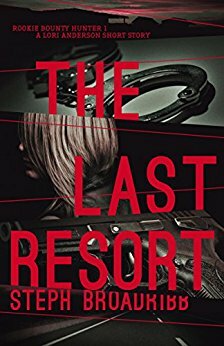 The Last Resort is a fun, quick read. It takes us back to Lori's days first training as a bounty hunter in the Georgia mountains with her mentor JT. For those who've read Deep Down Dead, it provides another look at a character we've met, while for those new to the burgeoning series, it'll give you a first-impressions insight into whether Lori might be a character you want to follow. There's certainly plenty about her that's worth following. Lori is tough while not being impervious, full of attitude but with plenty to learn. Brave, stubborn, and more. She's a really interesting heroine, and as I said in my review of Deep Down Dead, offers something deliciously different to the floods of middle-class suburban housewives or working mothers traipsing through oceans of domestic noir. Broadribb packs a lot into what is a short, quick read in The Last Resort. She skilfully evokes Lori's character, the complicated relationship between her and JT, and the surrounding landscapes of the Georgia mountains. There's a rawness and ruggedness to Broadribb's storytelling, a tough vulnerability that really draws you in. I think she's a superstar on the rise. Broadribb and Lori both. Like a great amuse-bouche from a great chef, The Last Resort gives you a wee taste of her skill, and leaves your mouth watering in anticipation for the courses to come.